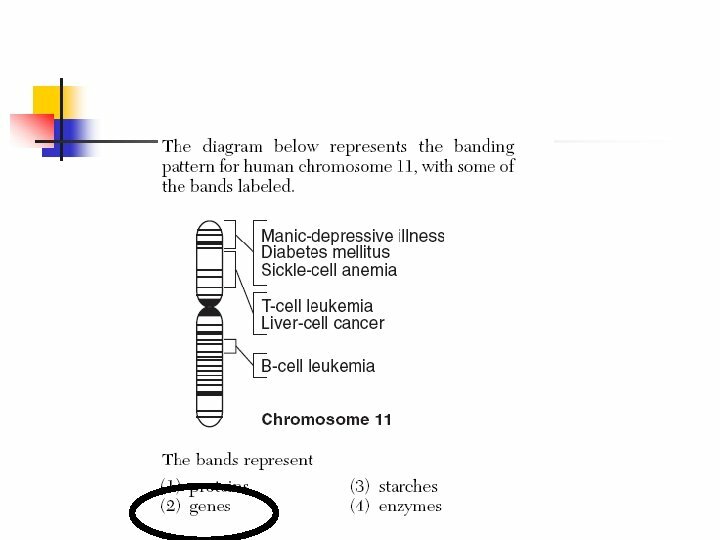 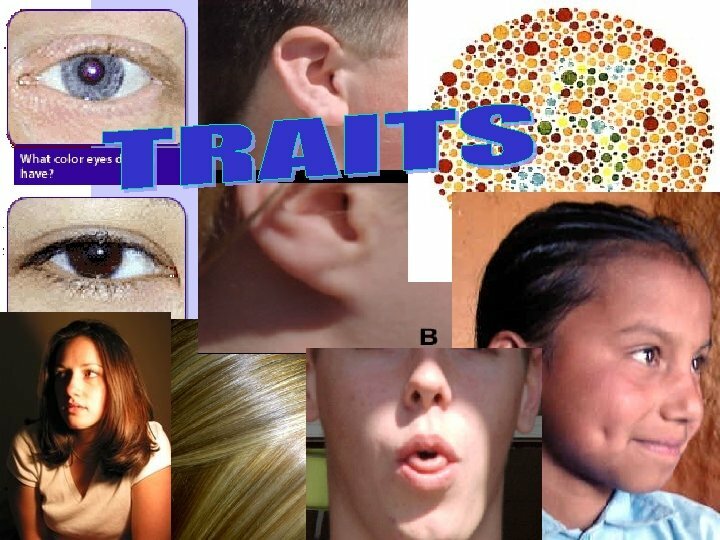 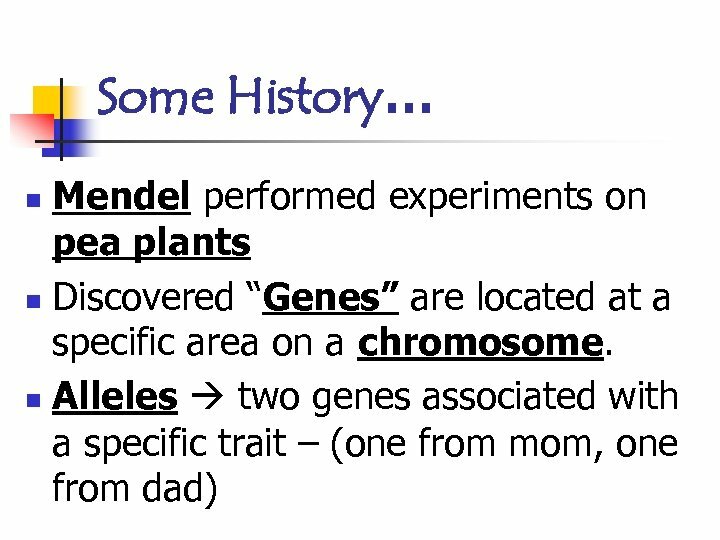 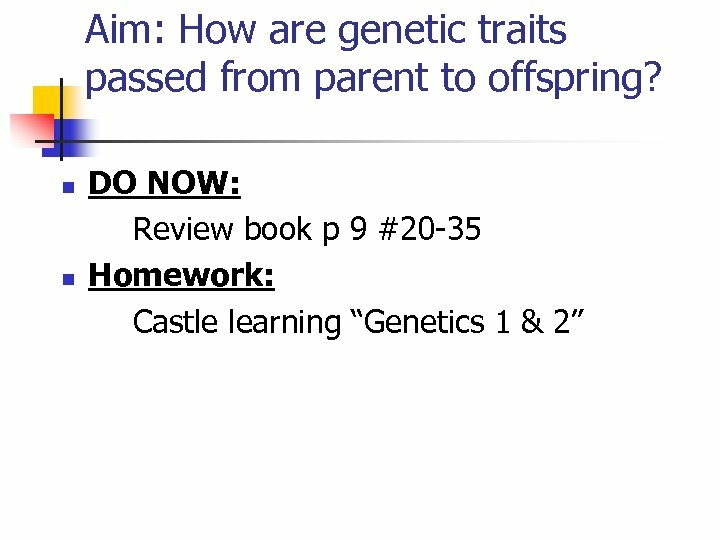 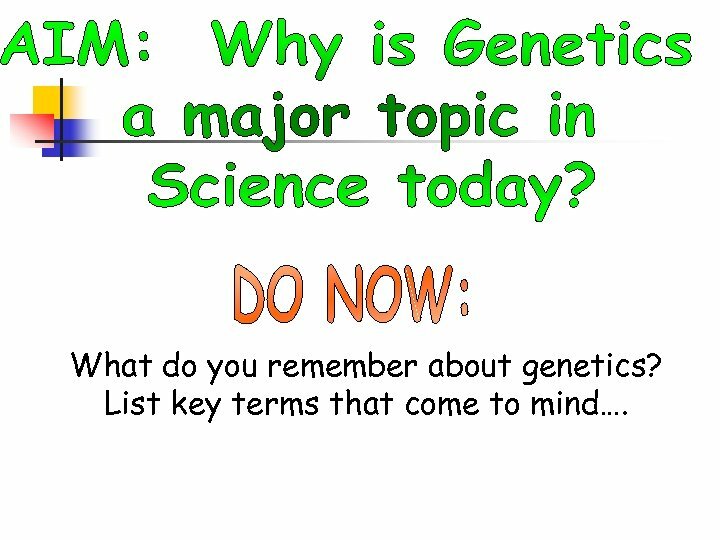 What do you remember about genetics? 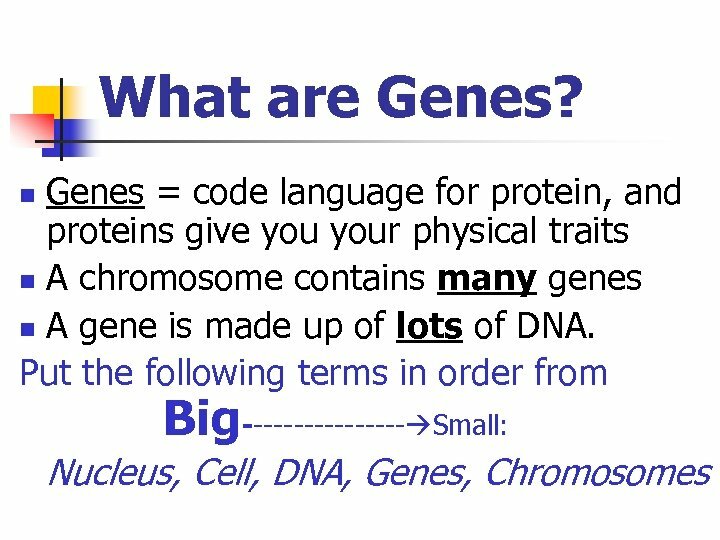 List key terms that come to mind…. 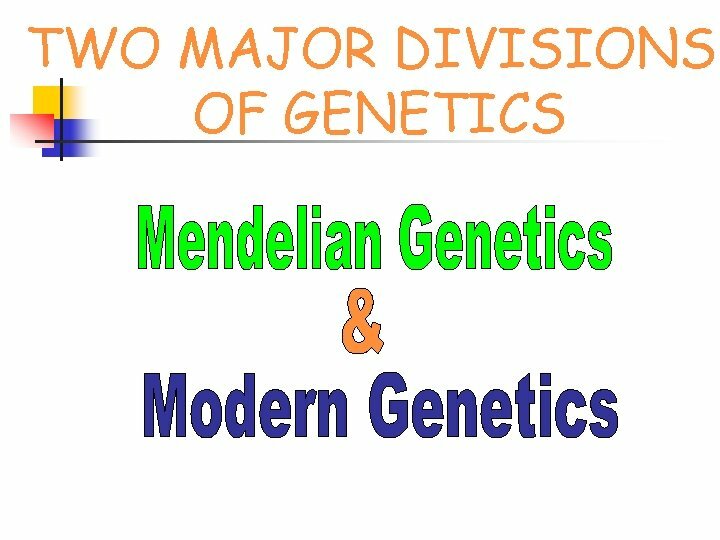 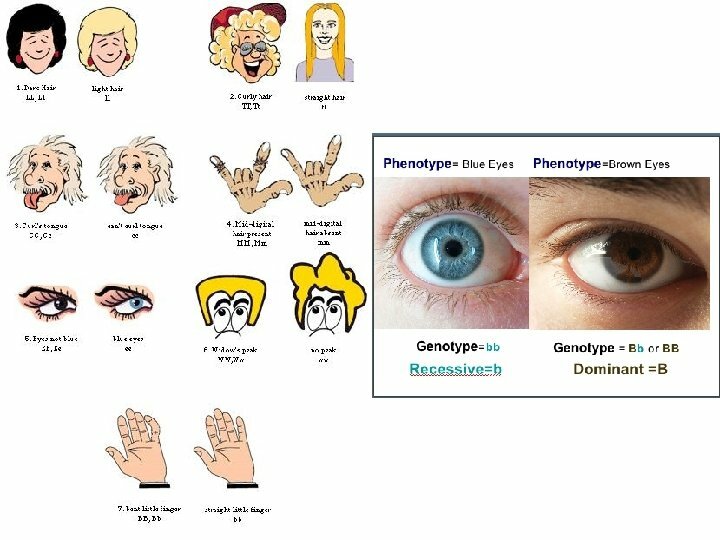 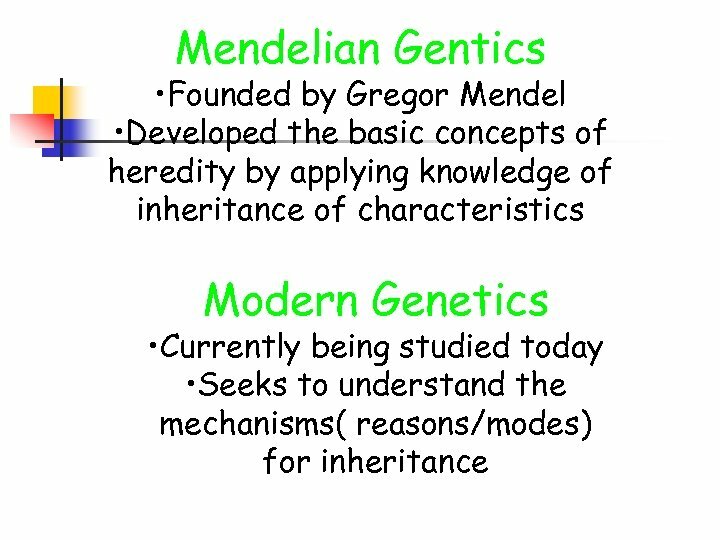 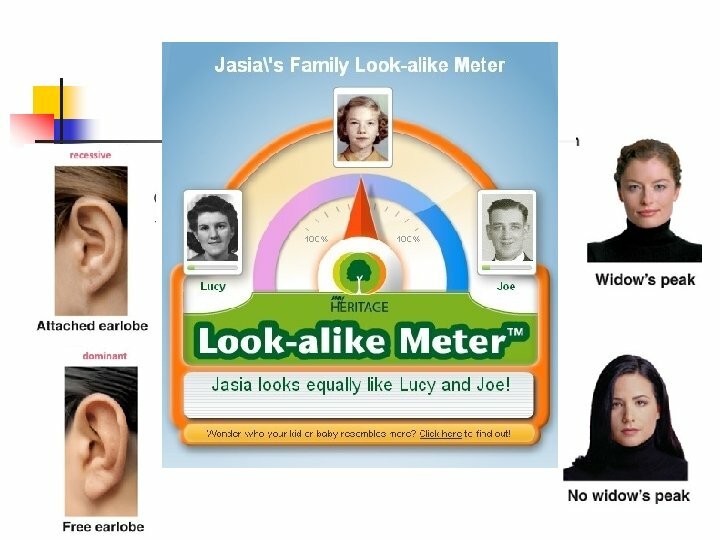 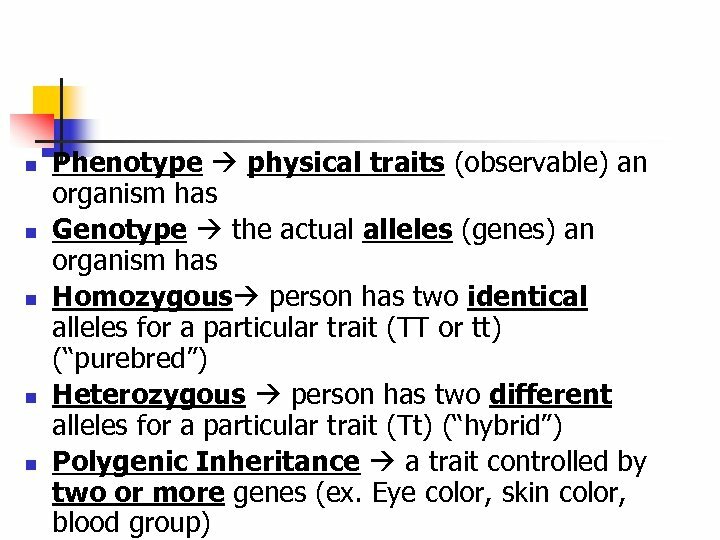 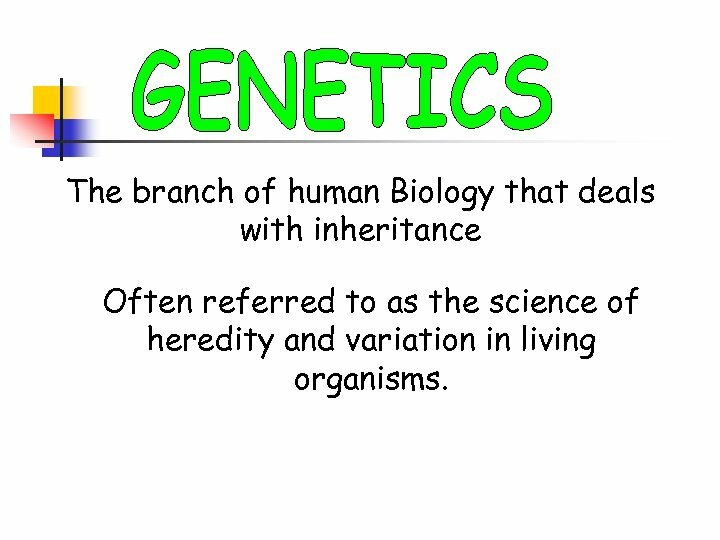 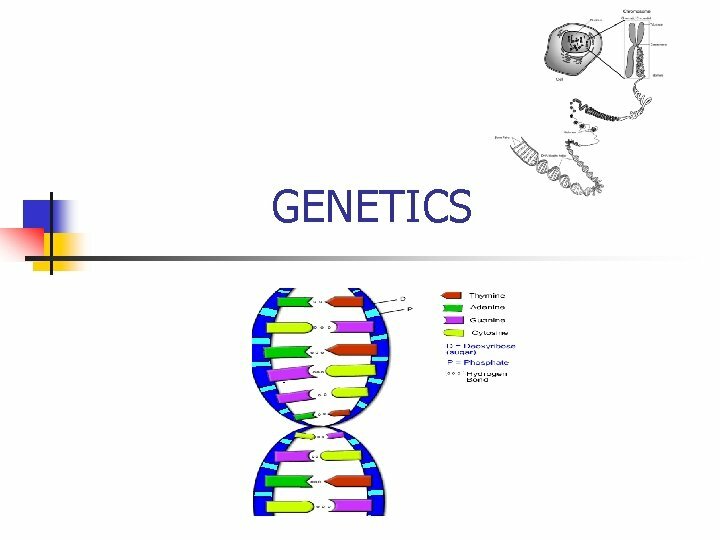 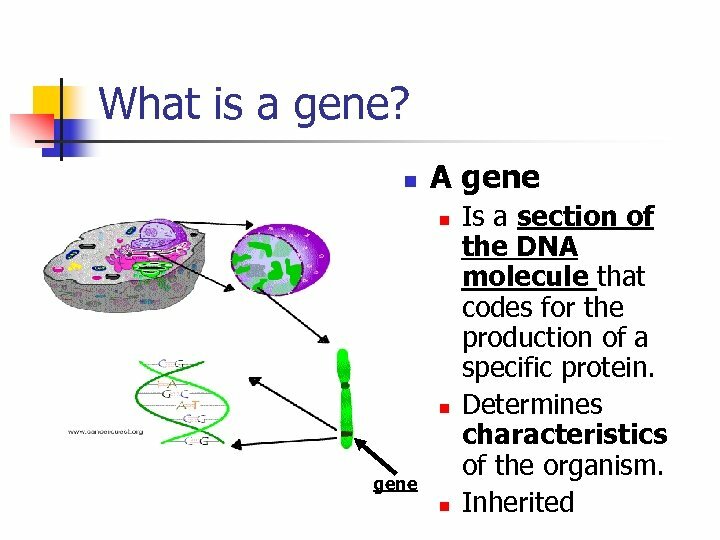 The branch of human Biology that deals with inheritance Often referred to as the science of heredity and variation in living organisms. 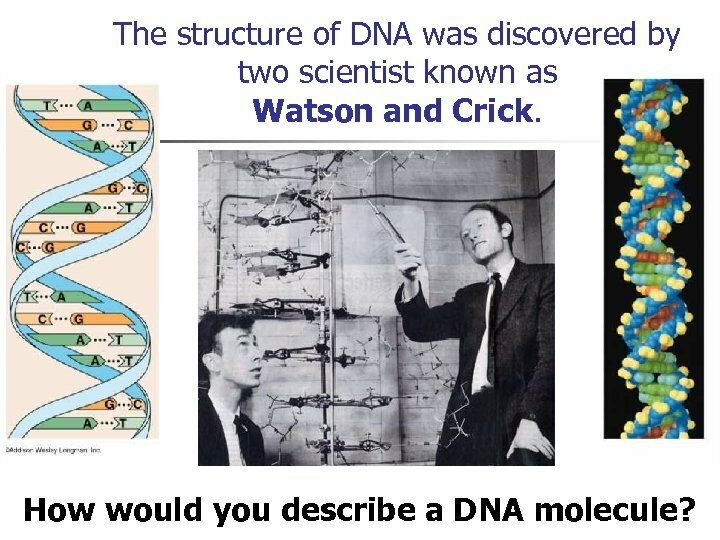 The structure of DNA was discovered by two scientist known as Watson and Crick. 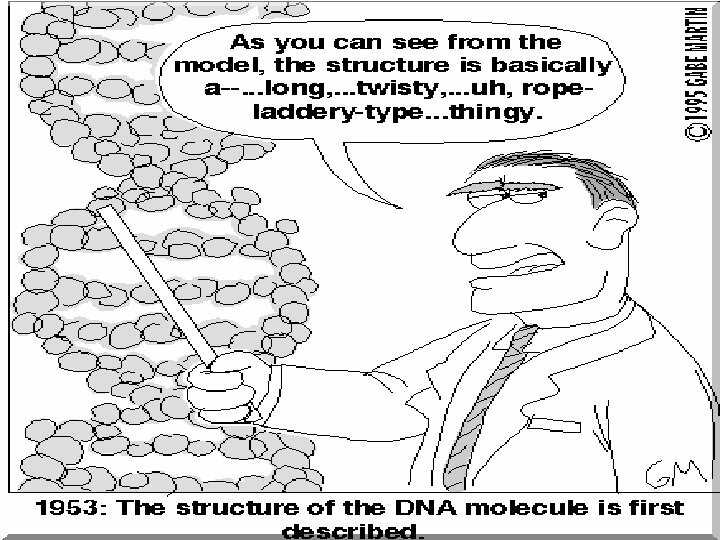 How would you describe a DNA molecule? 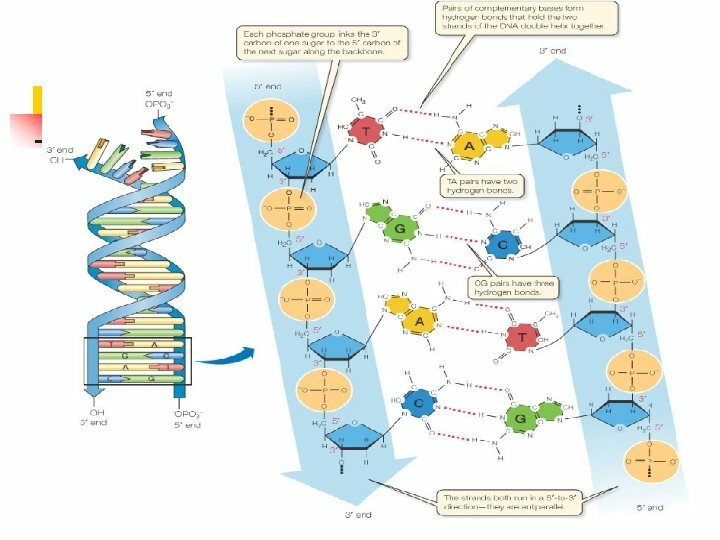 A DNA MOLECULE LOOKS LIKE A TWISTED LADDER. 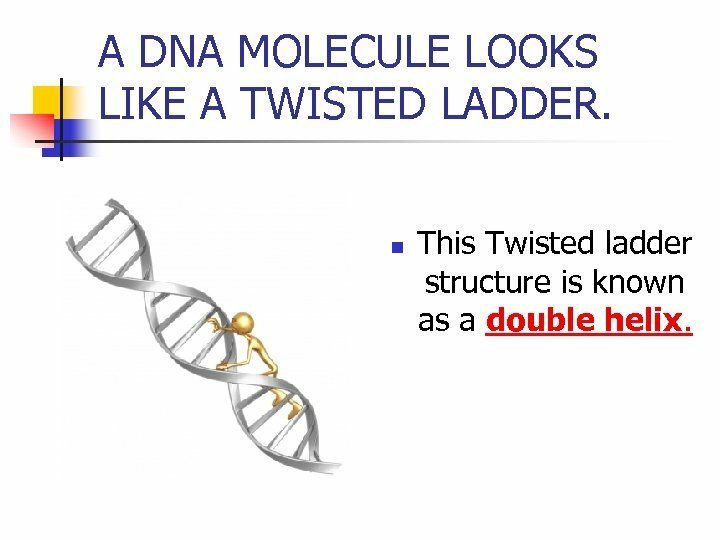 n This Twisted ladder structure is known as a double helix. 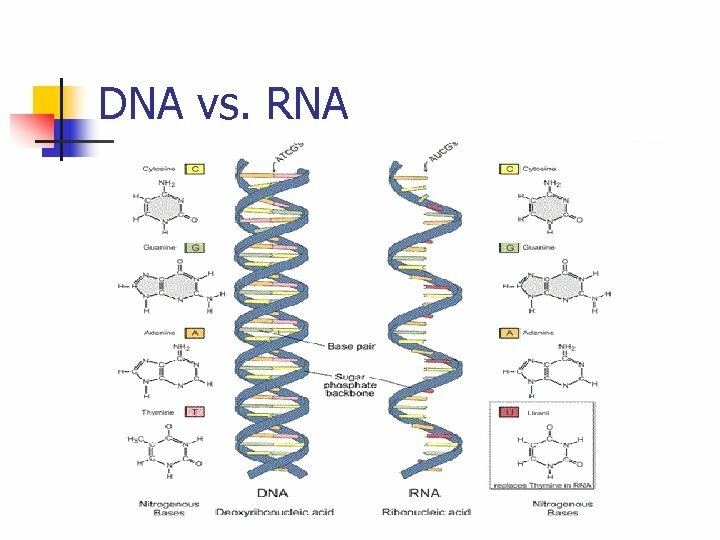 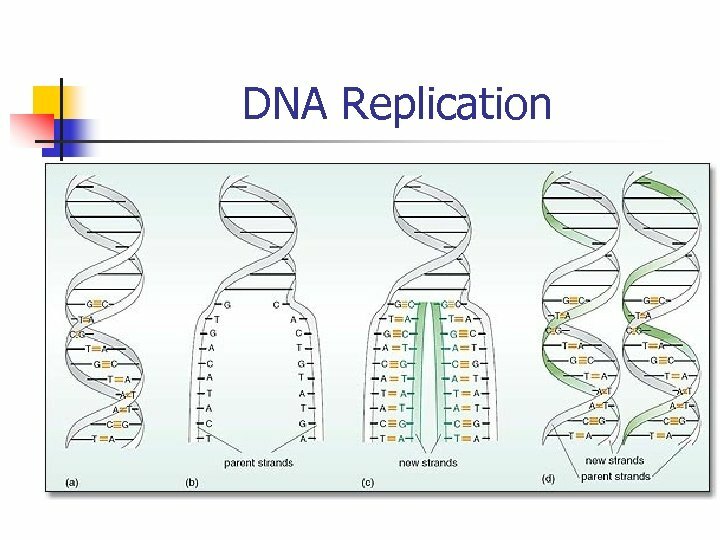 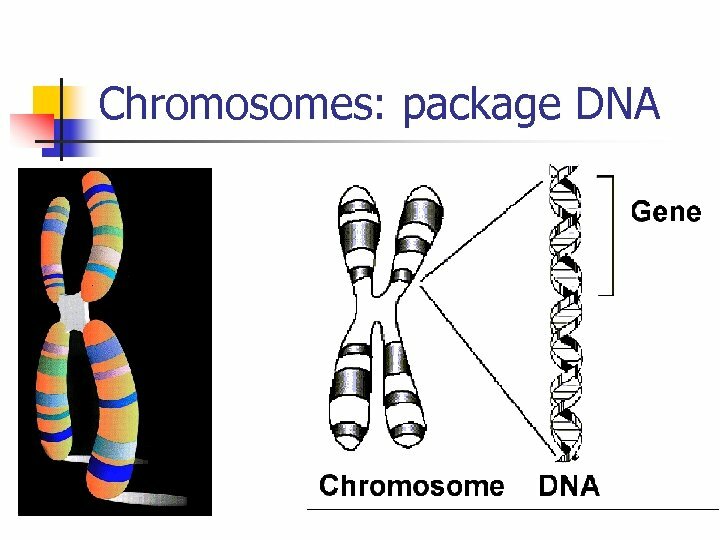 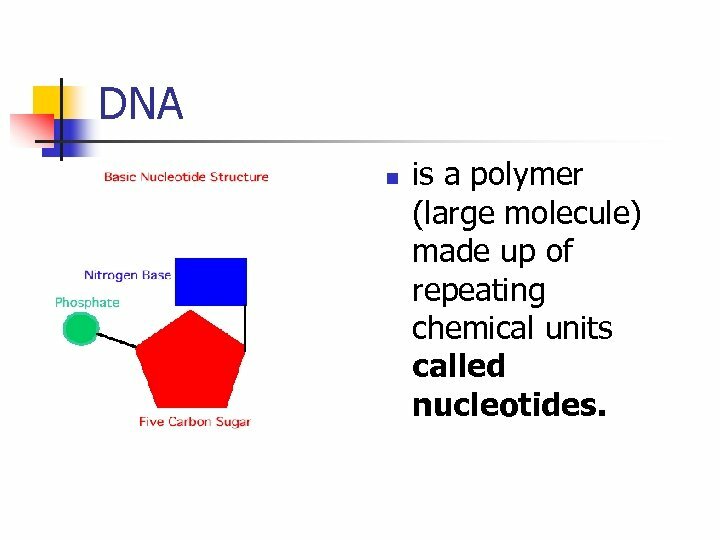 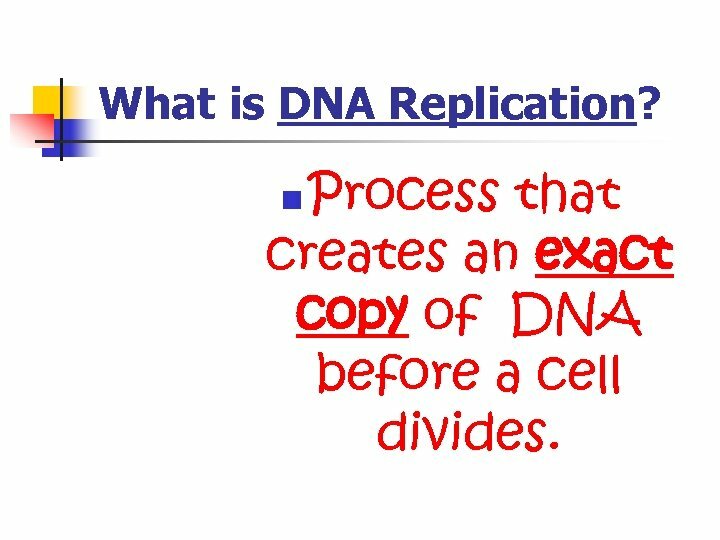 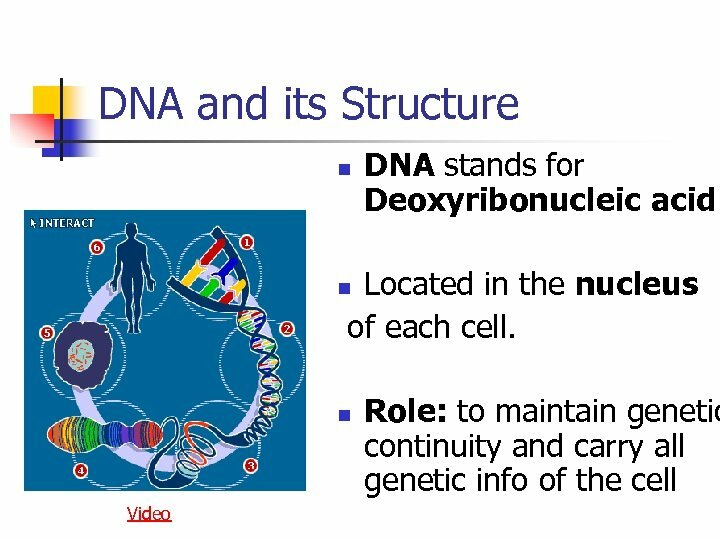 DNA n is a polymer (large molecule) made up of repeating chemical units called nucleotides. 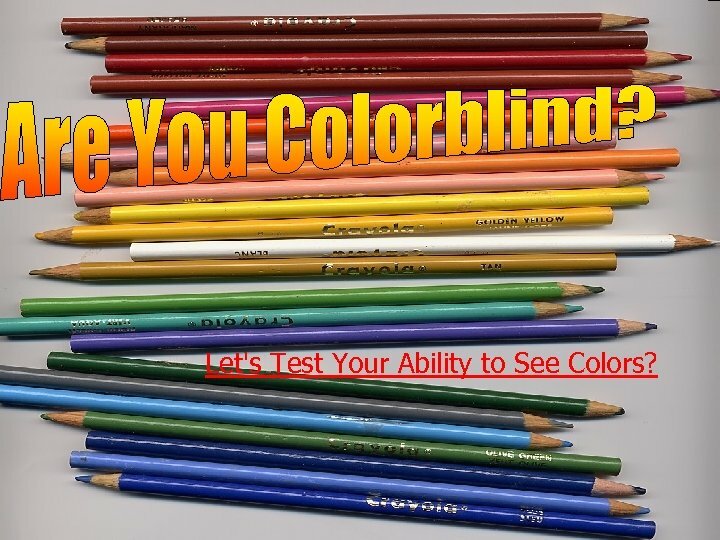 Let's Test Your Ability to See Colors? 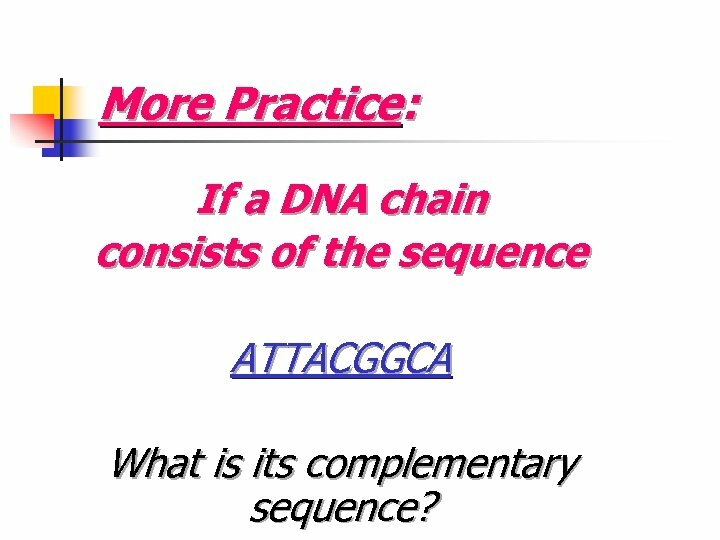 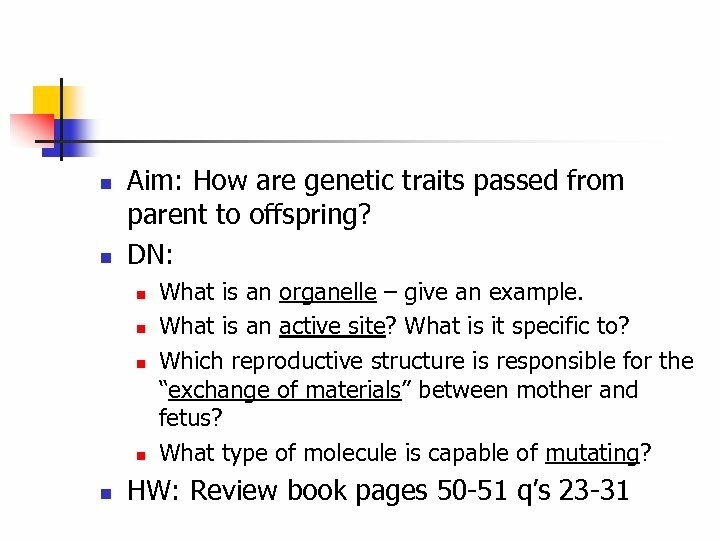 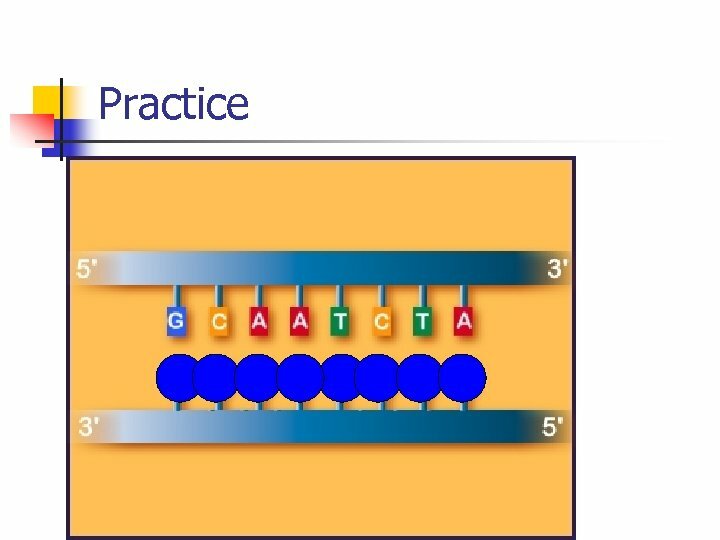 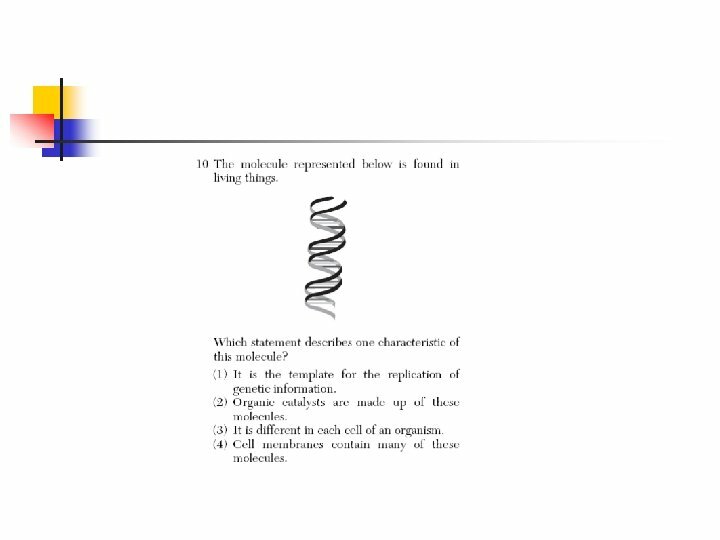 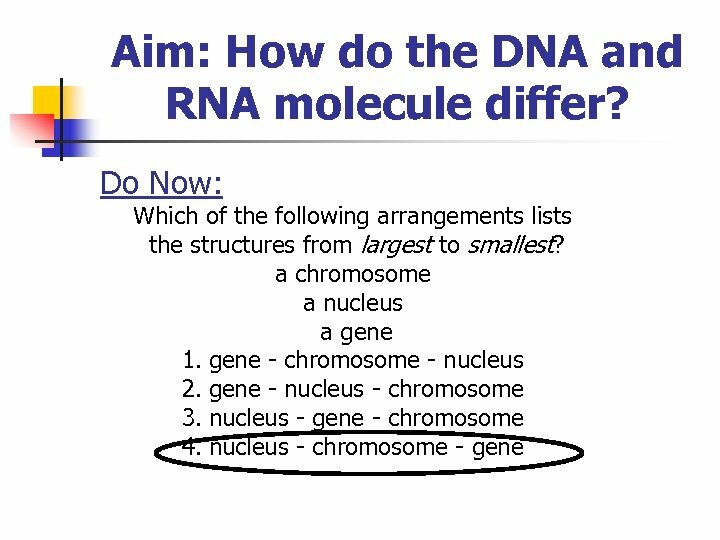 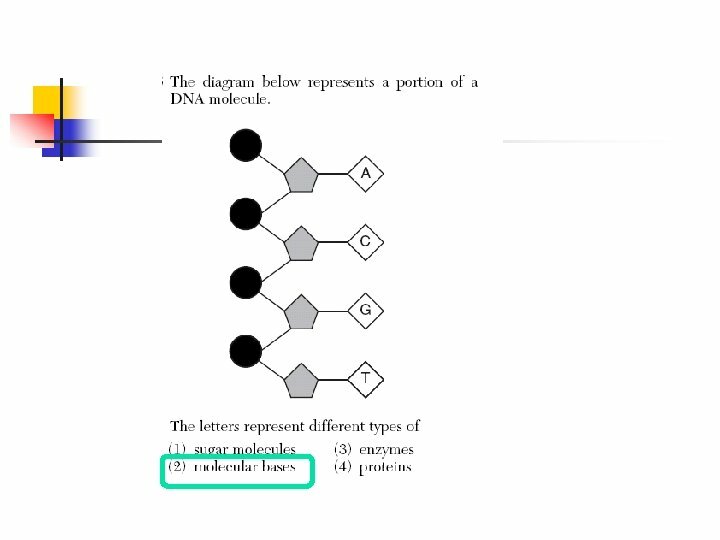 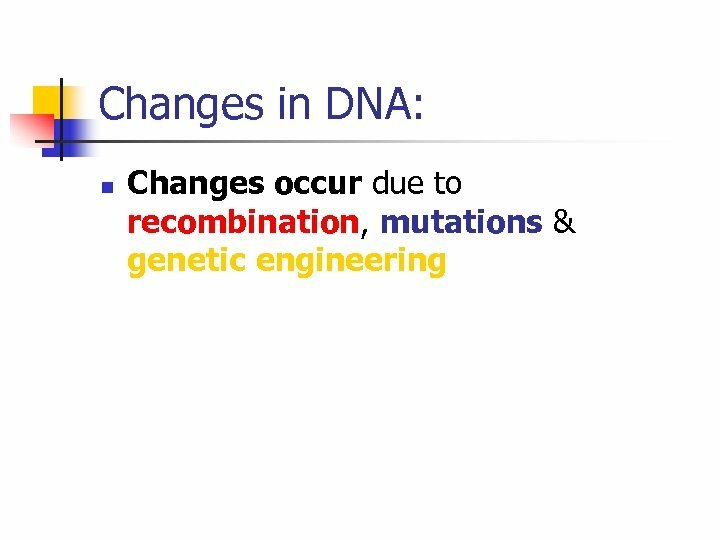 More Practice: If a DNA chain consists of the sequence ATTACGGCA What is its complementary sequence? 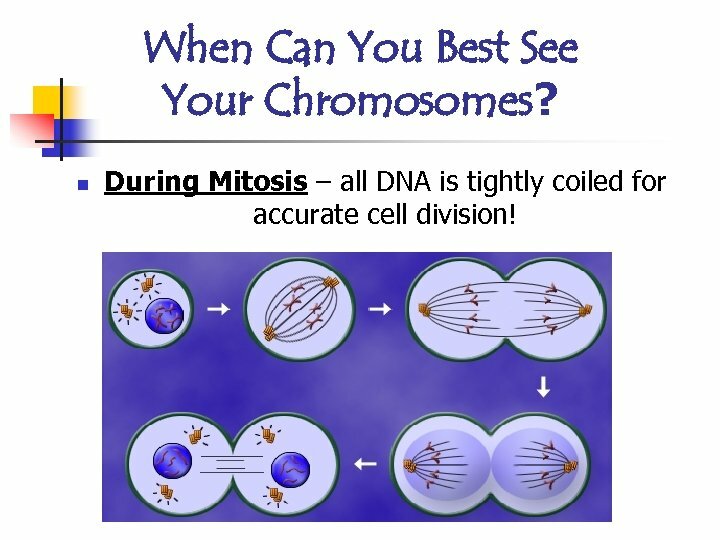 When Can You Best See Your Chromosomes? 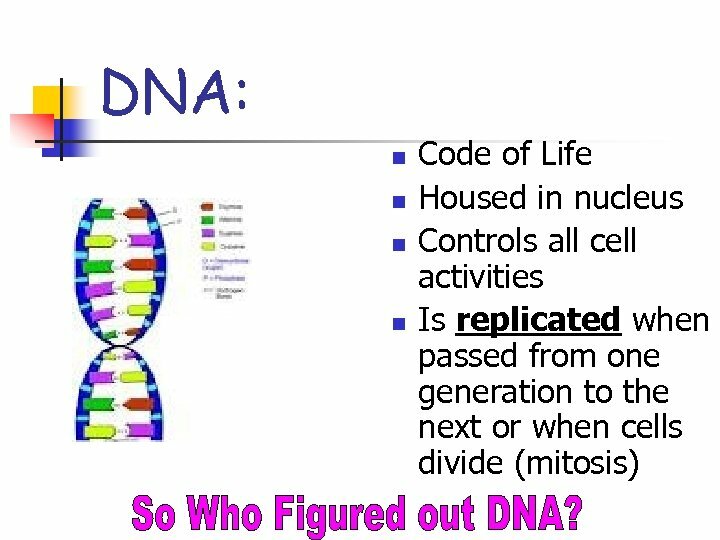 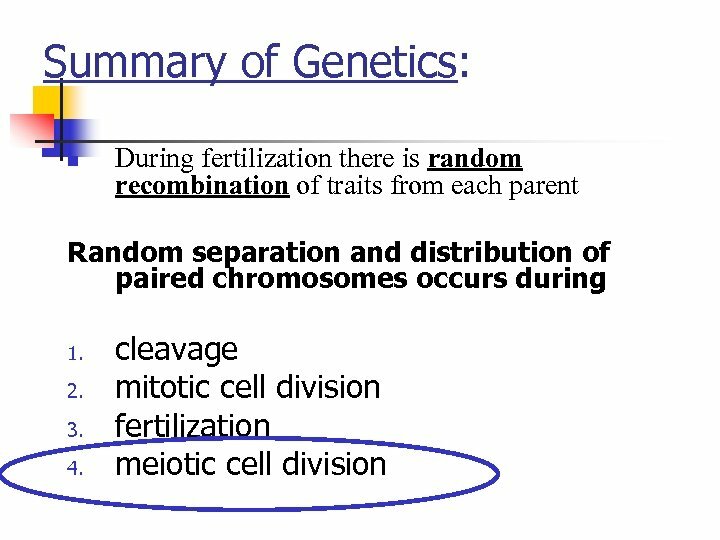 n During Mitosis – all DNA is tightly coiled for accurate cell division! 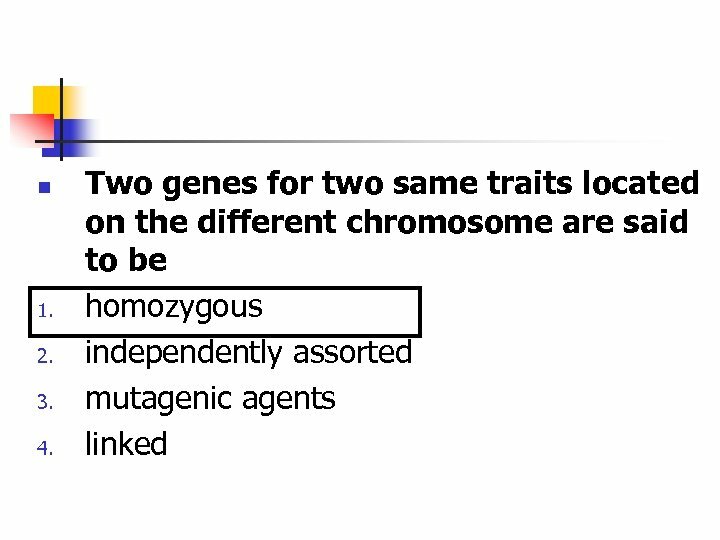 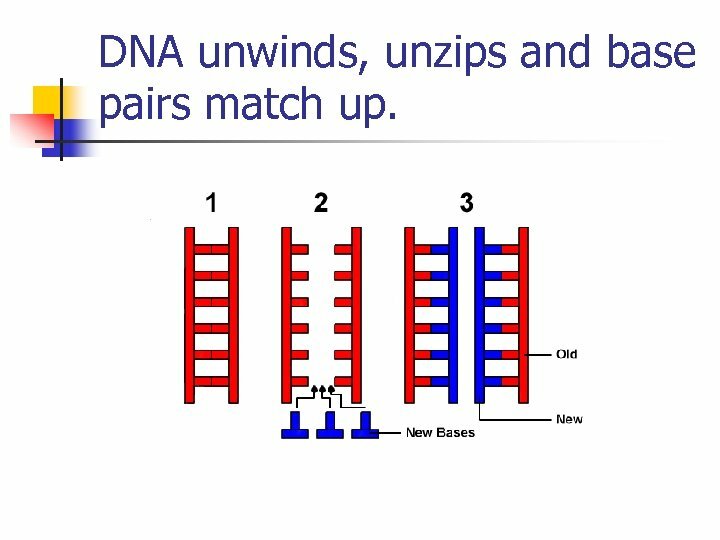 DNA unwinds, unzips and base pairs match up. 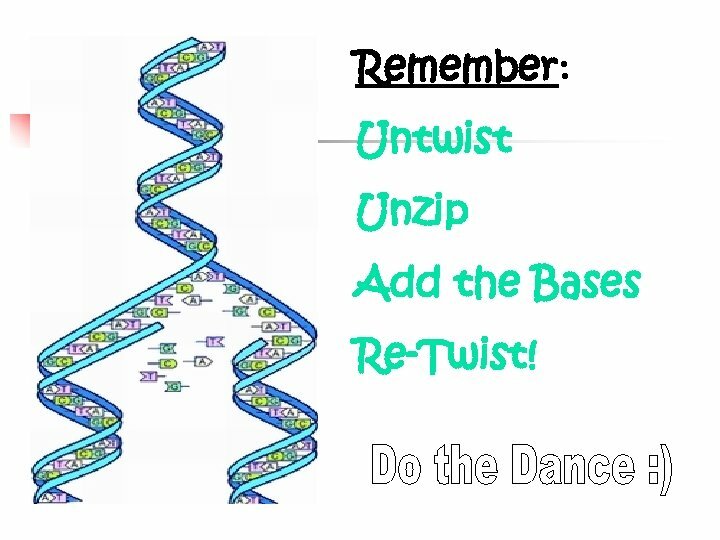 Remember: Untwist Unzip Add the Bases Re-Twist! 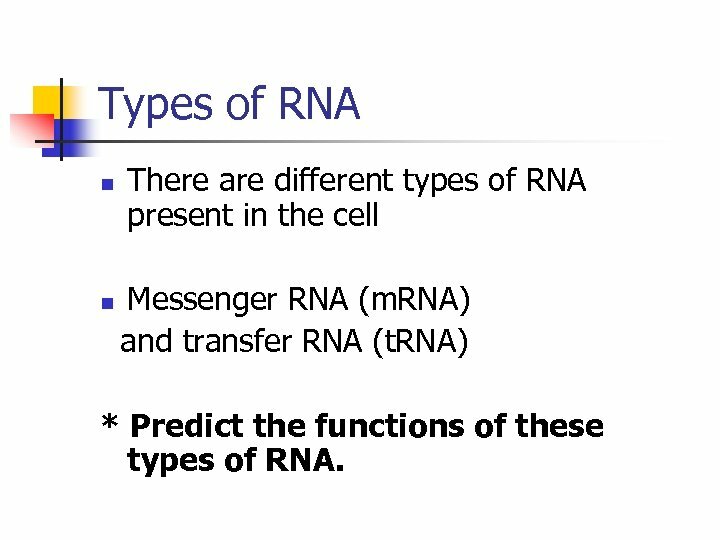 Types of RNA n There are different types of RNA present in the cell Messenger RNA (m. RNA) and transfer RNA (t. RNA) n * Predict the functions of these types of RNA. 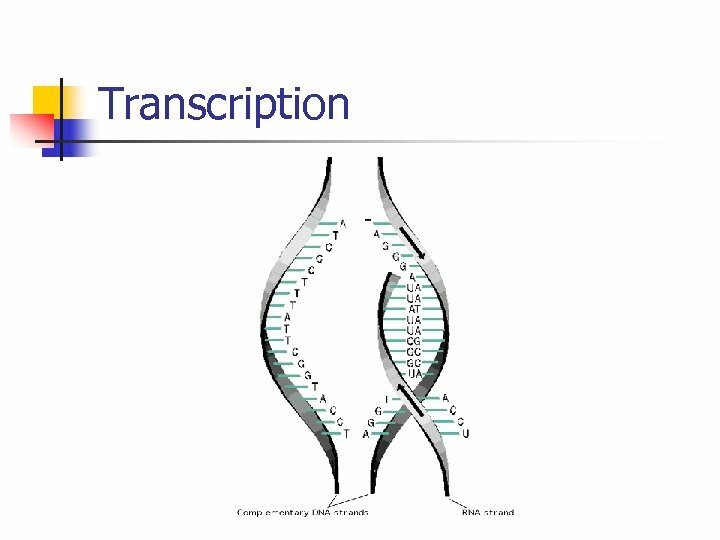 Transcription n The copying of a genetic message into a molecule of messenger RNA (m. RNA) is called transcription. 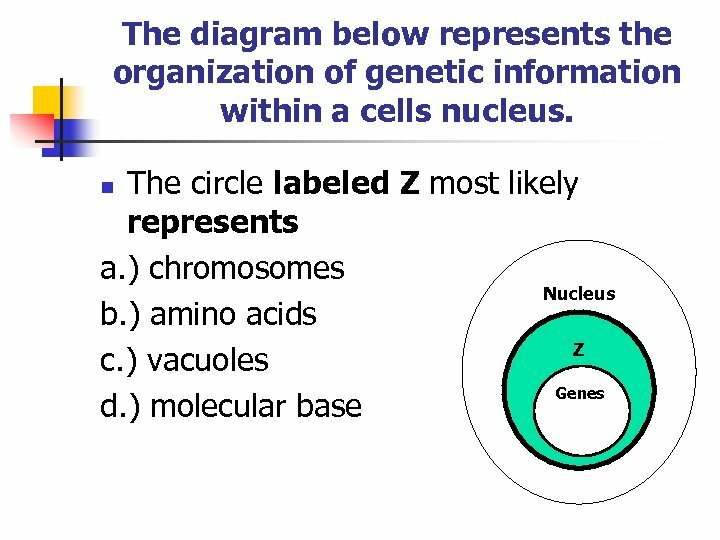 Reads the message on the DNA molecule in groups of 3 bases called CODONS while in the nucleus. 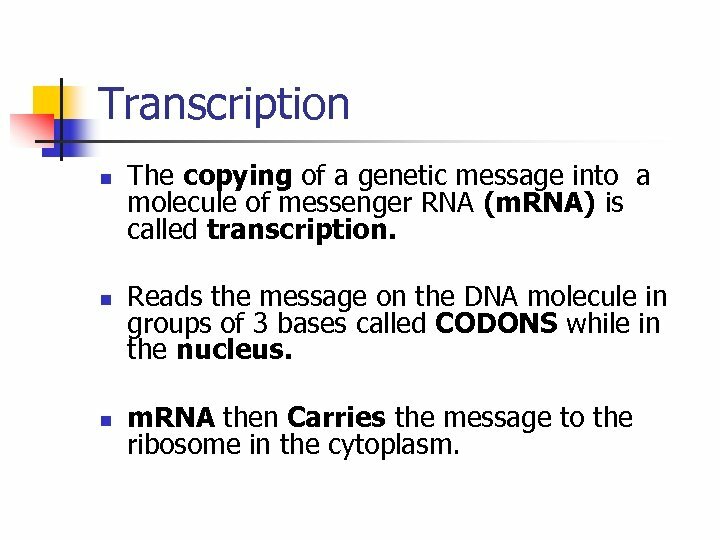 m. RNA then Carries the message to the ribosome in the cytoplasm. 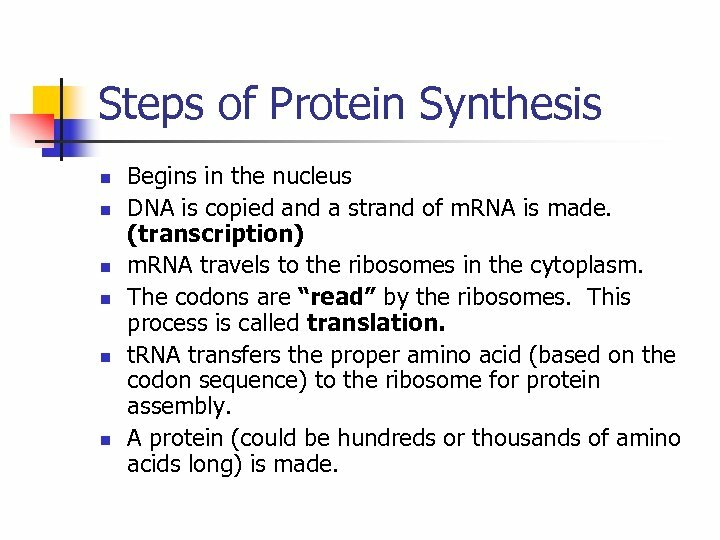 Steps of Protein Synthesis n n n Begins in the nucleus DNA is copied and a strand of m. RNA is made. 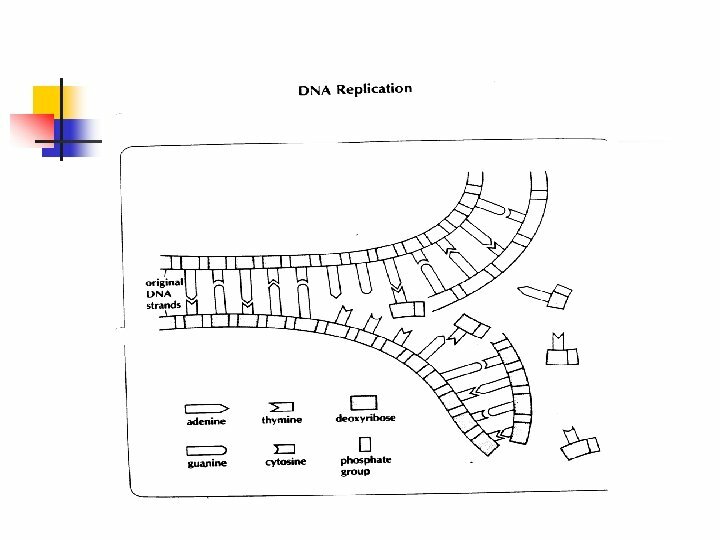 (transcription) m. RNA travels to the ribosomes in the cytoplasm. 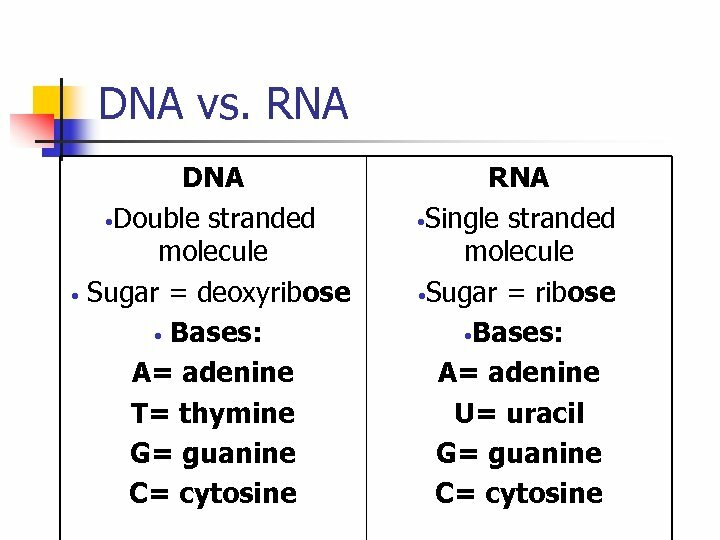 The codons are “read” by the ribosomes. 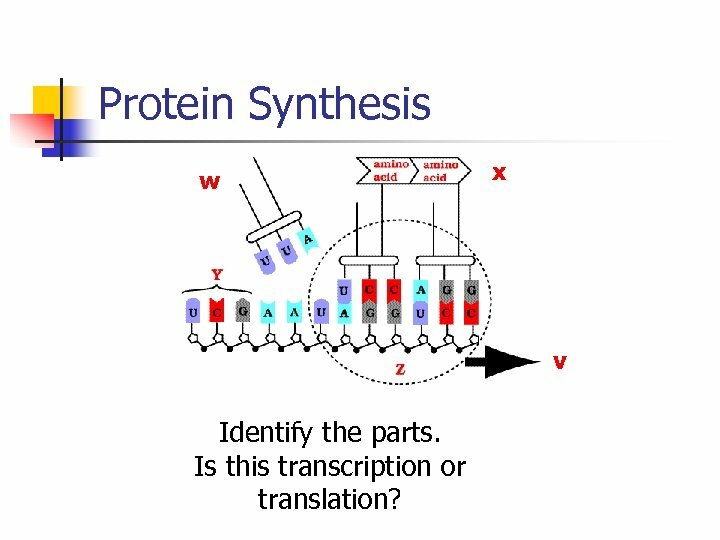 This process is called translation. 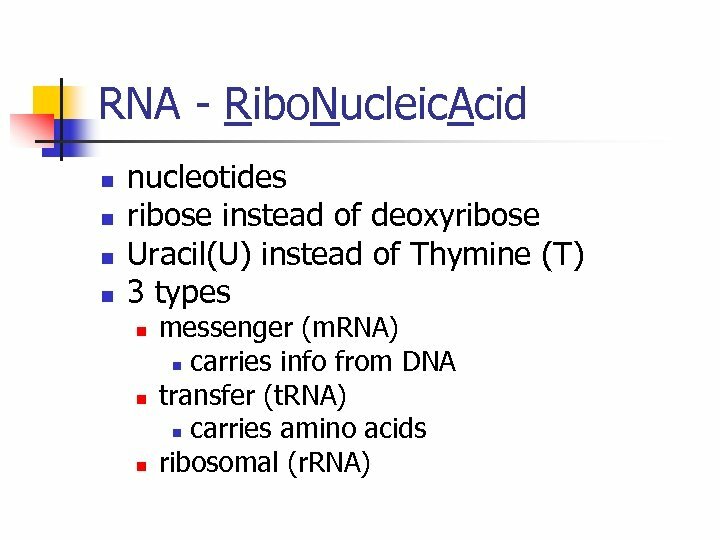 t. RNA transfers the proper amino acid (based on the codon sequence) to the ribosome for protein assembly. 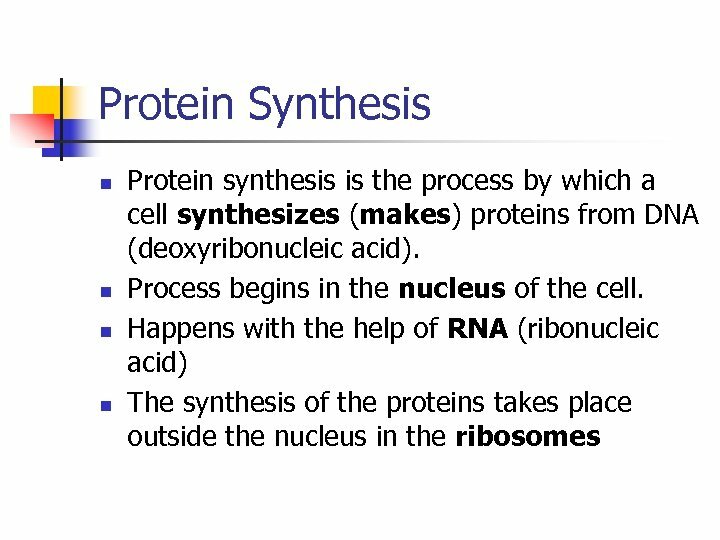 A protein (could be hundreds or thousands of amino acids long) is made. 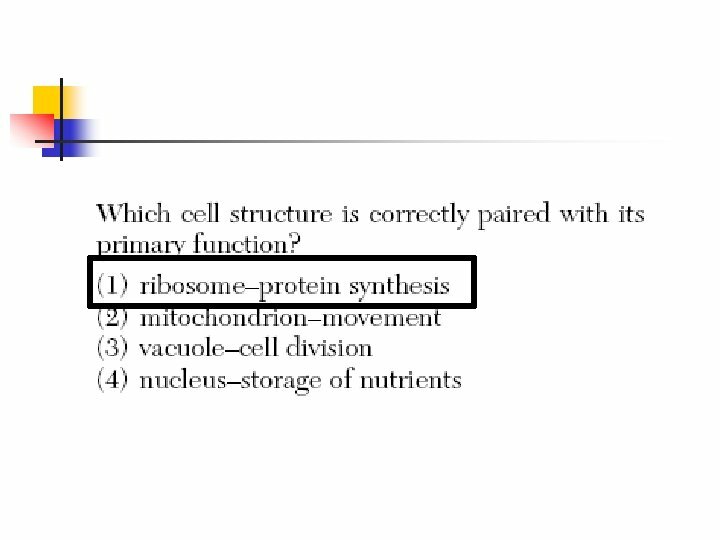 Protein Synthesis w x v Identify the parts. 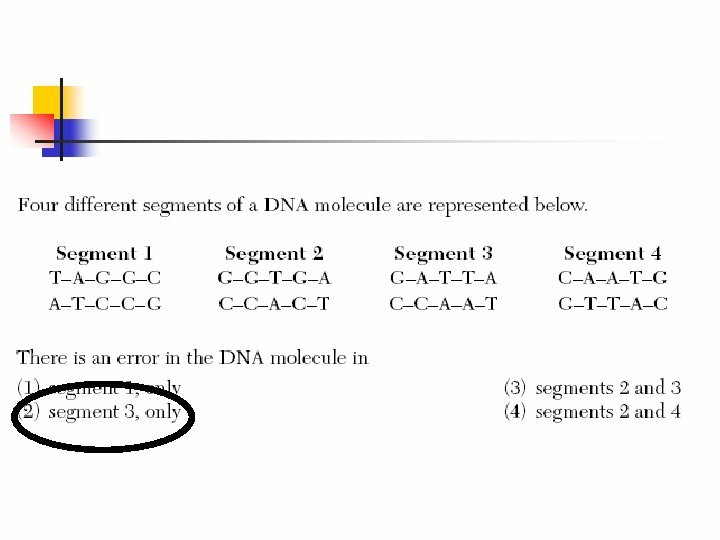 Is this transcription or translation? 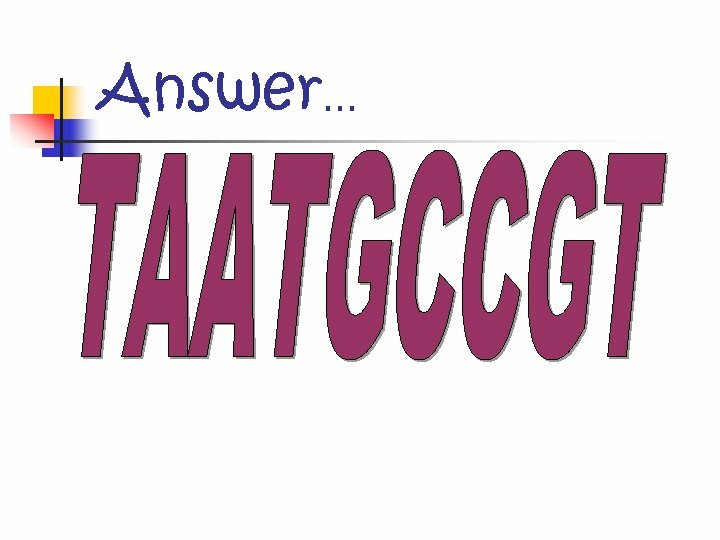 Translation n The language of m. RNA consists of 4 letters: A, U, C, G. n n n Each word is only made up of 3 letters or bases. 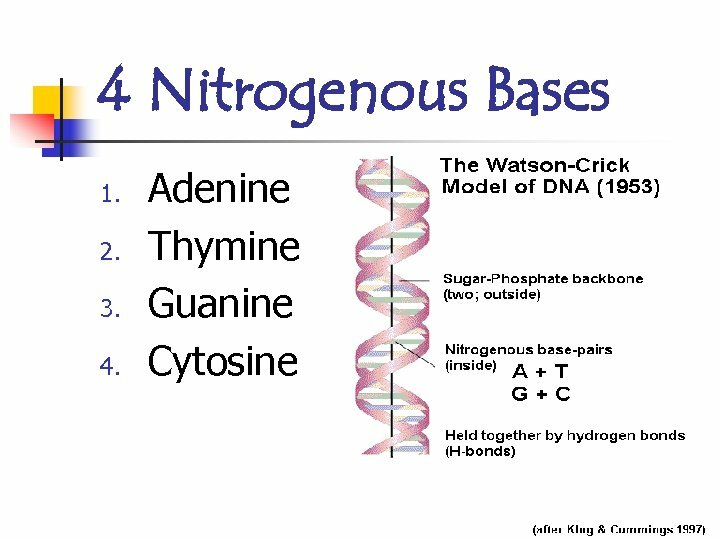 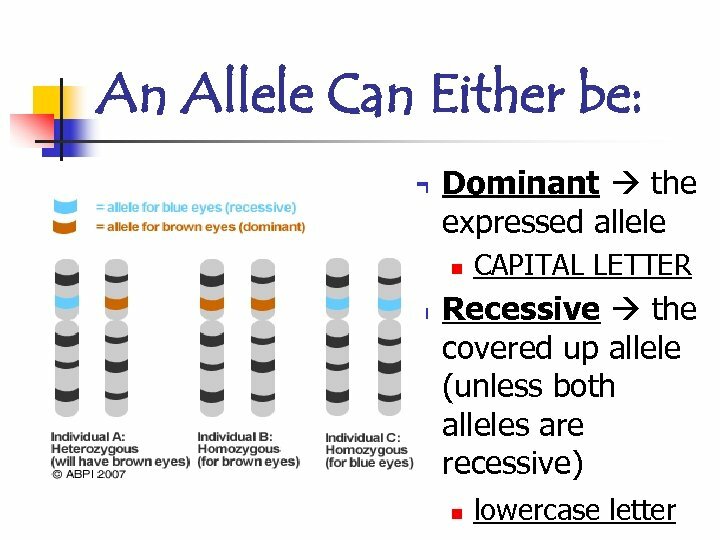 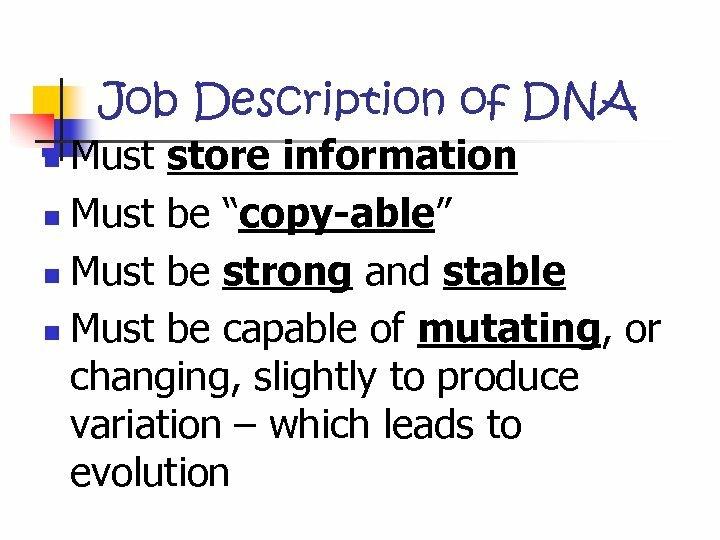 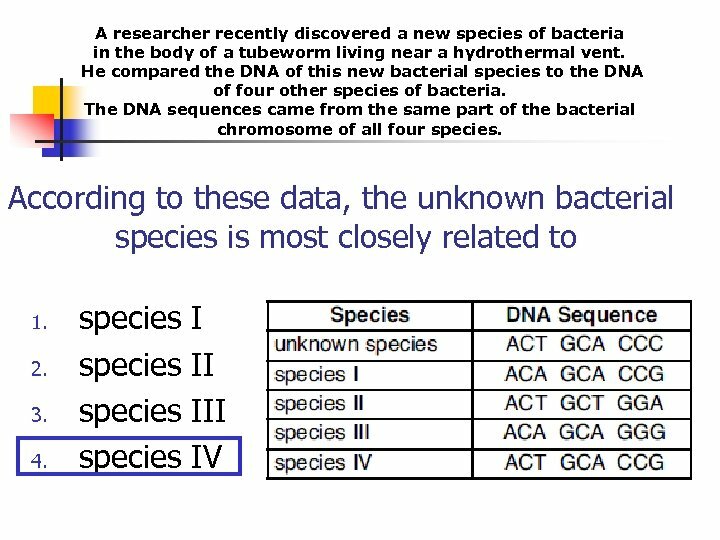 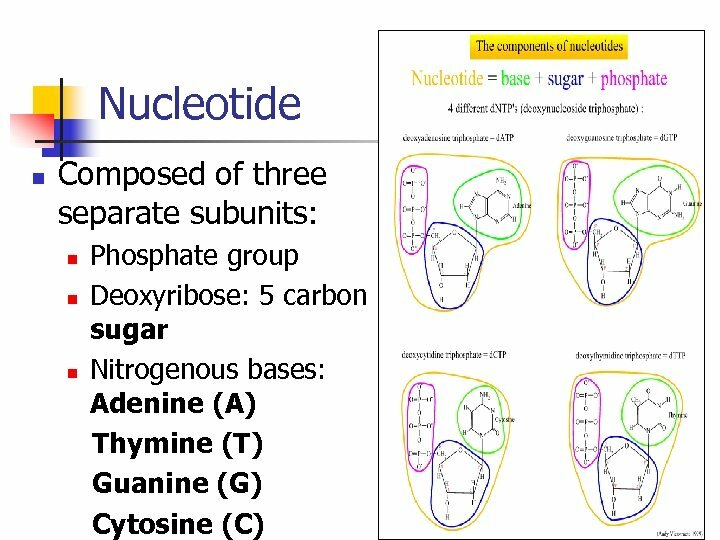 Every three bases is called a codon. 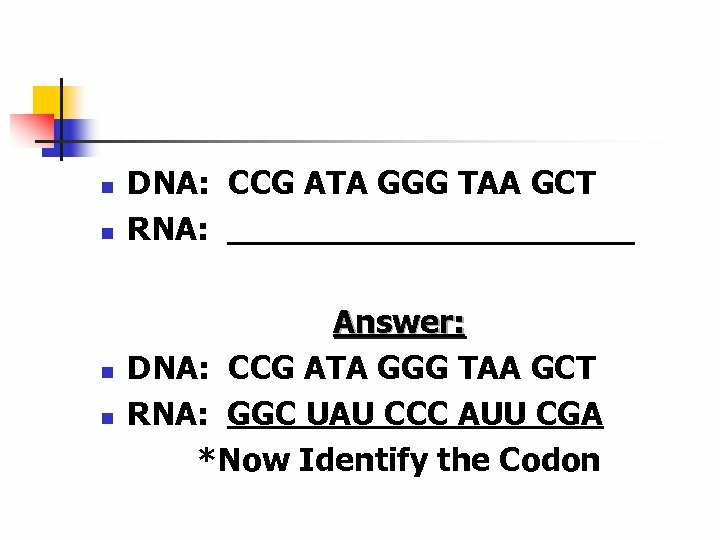 A CODON codes for a specific amino acid that must be added to the polypeptide chain or protein. 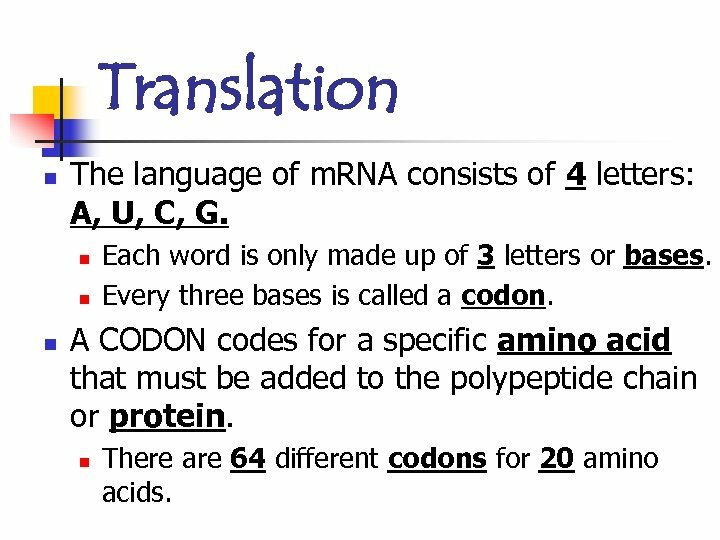 n There are 64 different codons for 20 amino acids. 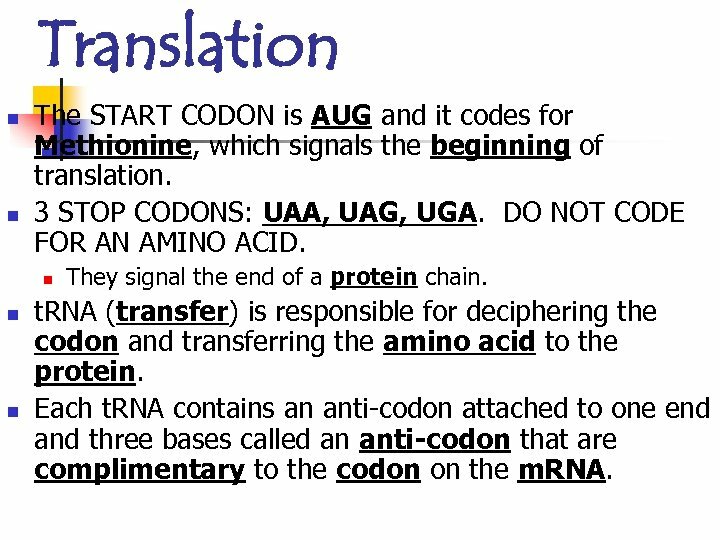 Translation n n The START CODON is AUG and it codes for Methionine, which signals the beginning of translation. 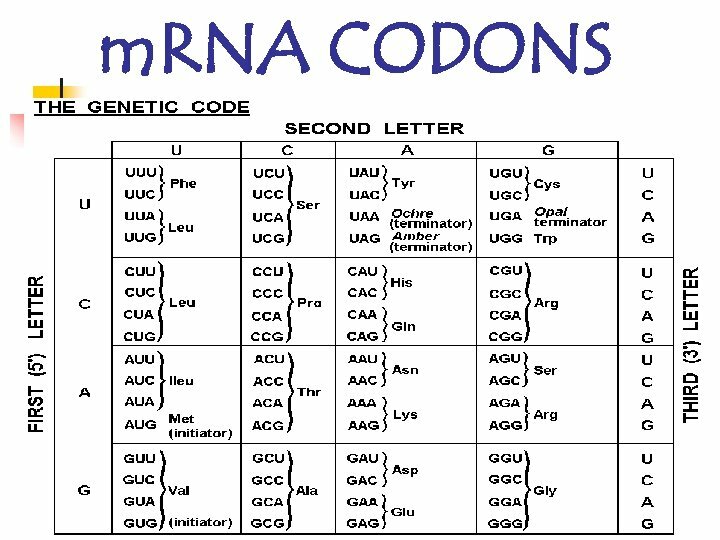 3 STOP CODONS: UAA, UAG, UGA. 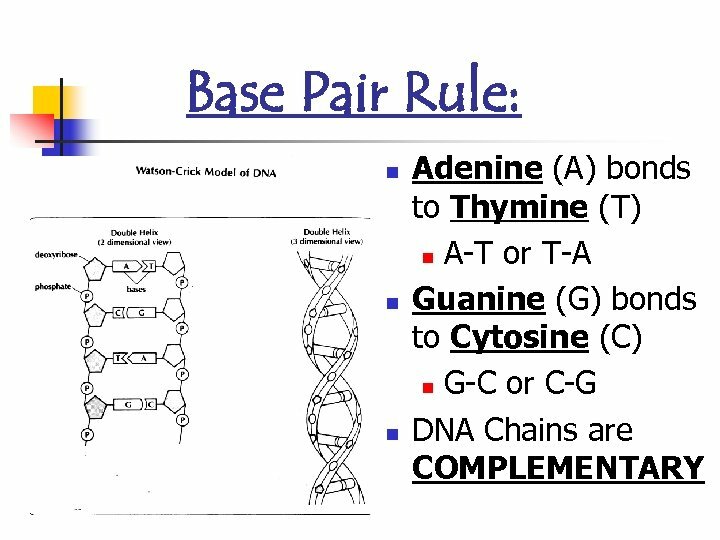 DO NOT CODE FOR AN AMINO ACID. 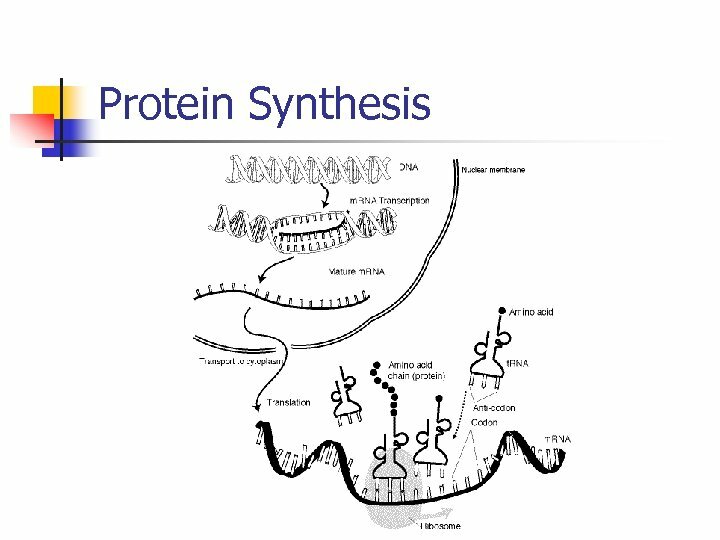 n n n They signal the end of a protein chain. 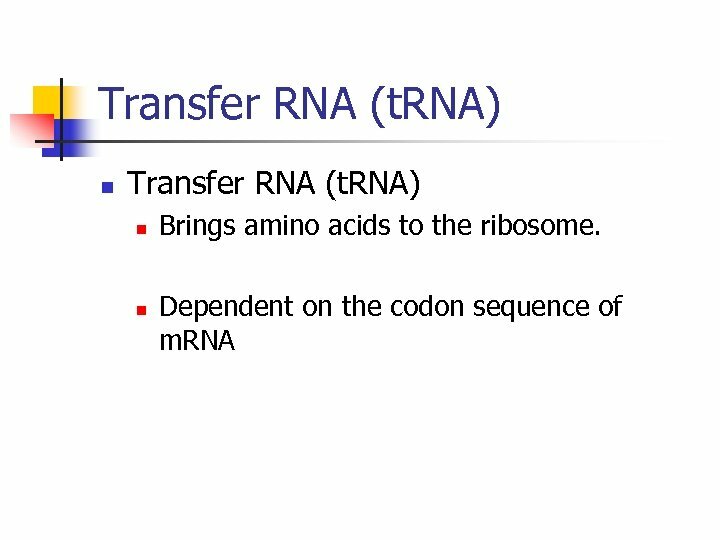 t. RNA (transfer) is responsible for deciphering the codon and transferring the amino acid to the protein. 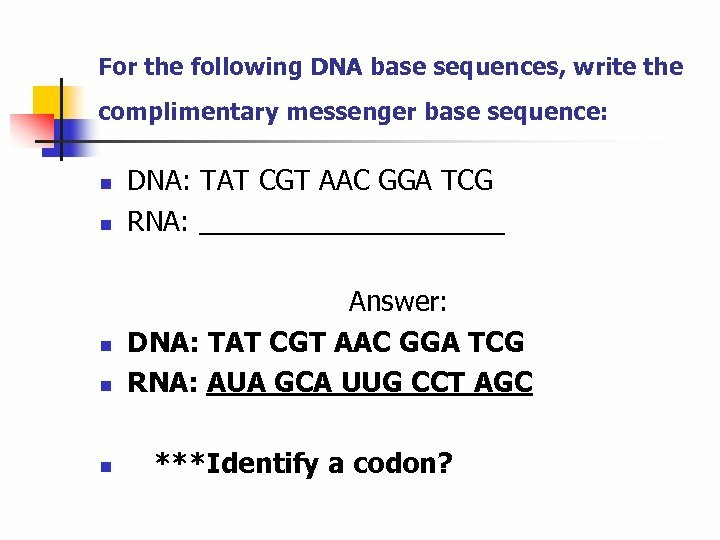 Each t. RNA contains an anti-codon attached to one end and three bases called an anti-codon that are complimentary to the codon on the m. RNA. 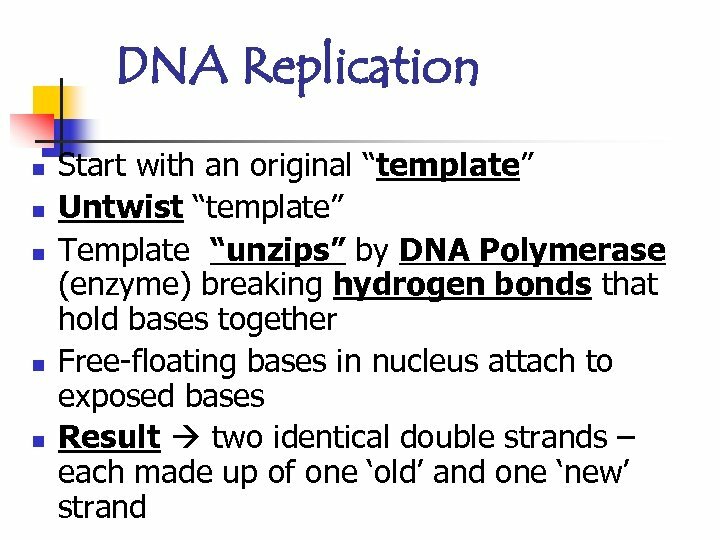 Protein Synthesis Transcription Translation DNA ----- RNA ----- Protein Analogy: Pair the correct genetics term with the construction site examples given. 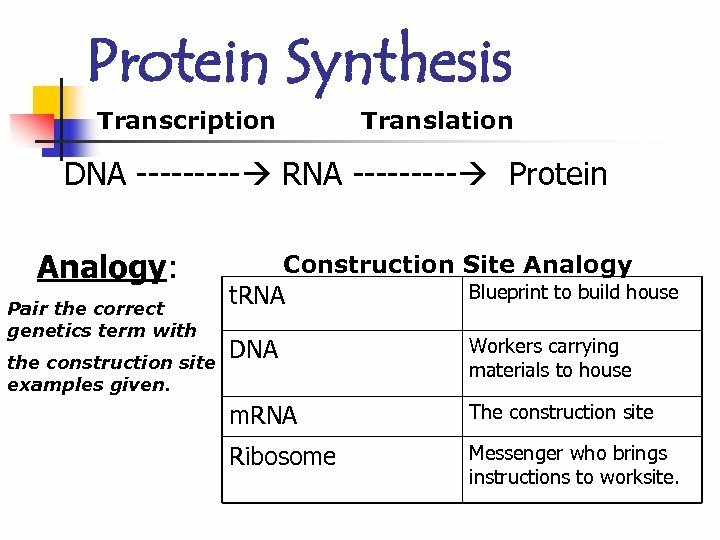 Construction Site Analogy Blueprint to build house t. RNA DNA Workers carrying materials to house m. RNA The construction site Ribosome Messenger who brings instructions to worksite.